Ever since I heard and read about the Pathfinder assignment for ETL 501- Information Environment, I have been scratching my head as to what online ‘host site’ would be the most appropriate, the easiest to use and the most visually interesting. I have finally settled on Yola but below I have evaluated a couple of different sites and what I thought of them. Free to join and a good range of free design templates to play with. What I really like about the templates is that I can use my photoshop skills to design the banner across the top of the page. Adding content to the page is very simple. You select a ‘container’ from the list on the right of the page and drop the container onto the page where you want it. There are ‘containers’ for text, video, images, gadgets and widgets. I really like the ability to put in custom embed code so it can accomodate widgets that are not part of it’s gallery. Another advantage is that the site stays private until I send it live but that is also a disadvantage in that I can’t share a draft of the site with colleagues so that I can collaborate with them or get their input into improving the site. What I don’t like about the site is that you can’t change page fonts and colours. This caused an issue when I uploaded my custom banner and you could not read the name of the page because it was white. It really needs to allow the designer to choose from a small range of web friendly colours. I spent a lot of time this past week playing with wikispaces for a workshop I was facilitating and discovered that the site does allow you to add embedded widgets such as shelfari. You do get more editing ability with the fonts but unless you have the right kind of subscription and a knowledge of CSS scripting with wikispaces you can’t customise the background templates. Google sites is very similar to Yola in that the user can drag and drop content ‘containers’ onto a website template. It also has similar abilities in the way widgets and gadgets can be embedded. The reason why I did not persue my use of google sites was that I wanted to develop a pathfinder that was not blocked by the government web filtering service and also end up with an easy to type URL for students. It is now time to start looking at developing a 3 year vision or plan for both the school library I work in and my next university assignments. Perhaps I can blend them together eventually and save a lot of time and stress in the long run. 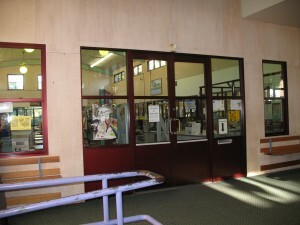 What does the school community need from the Information Resource Centre? Davies & Davies (2005, p.9) describe that is critical that a leader creates a strategy with others and not dictate it. In the case of a school library team- it would allow discussion, debate, the suggestion of innovative ideas based on the ideas of others. Most importantly it would give the ‘team’ ownership of the vision and hopefully a willingness to fully commit to the implementation. Davies & Davies cite Burgleman and Grove (1996) to describe that organisations reach key moments for strategic change ‘when it is possible to develop new visions, create new strategies and move in new directions.” (p.11) For the library I work in, I think that time has come as the school moves into its evaluation phase in preparation for the new 3 year plan. Davies, B. J., & Davies, B. (2005). The dimensions of leadership : the strategic dimensions of leadership. In School leadership in the 21st century : developing a strategic approach (2nd ed.) (pp. 7-16). London : RoutledgeFalmer. I am trying to be optimistc and positive about this group assignment as being negative doesn’t achieve anything except increase stress. 1. The design of the PowerPoint is fantastic- I am very proud of it. 2. The two missing group members are back online and trying to contribute. 1. We need a logical structure to focus our writing. 3. We need clearer guidelines from the lecturer about what our PowerPoint should look like ie structure, word count etc. In my reading and research I did come across Lencioni’s 5 dysfunctions of a team. Our group is experiencing every one of the dysfunctions. I have just been reading an interesting article on conflict resolution which might come in handy : Mackay, H. (1998). Resolving conflict through listening. In The good listener: better relationships through better communication (pp.189-199). Sydney : Pan Macmillan. It is 5 days to the next Skype conference. Here’s hoping that we can get it all together…. I still want this assignment to be over…. The last few days have been very frustrating. Since our Skype meeting 2 of the members of my group have stopped contributing anything to the group wiki. One has been sick but she promised to upload her contribution before the end of the weekend and the other is not responding via emails at all. I will have to try and ring him from work tomorrow. If there have been problems then, in my opinion the considerate thing to do is ring or email and say I have a sick child, so that the rest of the group is aware that the person will be offline for a few days. Now all the work has been left to the 2 of us. Fortunately I have been teamed with someone who is very gifted at reading copious amounts of information, making sense of it and is very generous in sharing his analysis with me. I have been trying to contribute my readings as well as designing a fabulous powerpoint template for the assignment. If I do say so myself- it is the best one I have ever created. 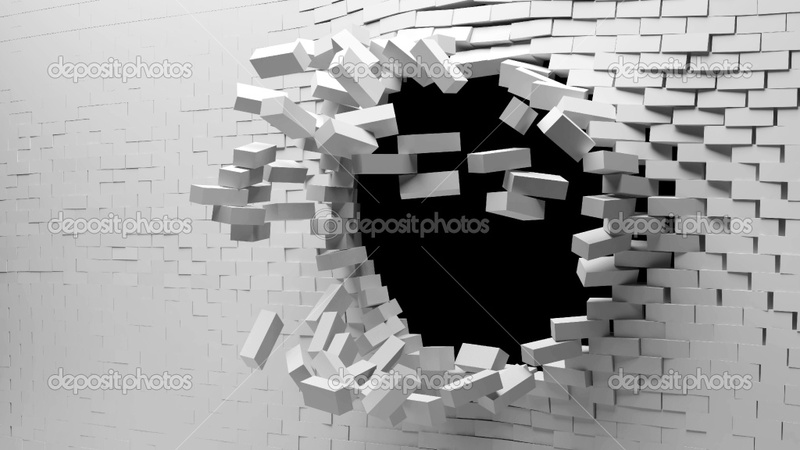 I bought a photo of an exploding brick wall and manipulated it in Photoshop. Between the 2 of us remaining members of the group, we have chosen the colours of red, white and black as the key colours of the presentation. At this point- I don’t care about our missing group members. I am working to get the best possible mark for my pair and I. My pair and I have decided that when we get to the next Skype meeting and the other 2 show up- they can’t make changes unless they contribute this week. To make matters worse- the lecture has failed to provide standards referenced frameworks for this assignment. In class, all teachers are expected to demonstrate examples of each marking band ie what does an A look like? If this was an assignment in high school- it would be challenged by the assessment committees for the contradictory instructions and lack of standards referenced frameworks. I so want this assignment to be over… NOW! I have just experienced my first group conference call on Skype to work on the proposal for the group work assignment. I am glad I bought the group conferencing ability because it meant that I could talk to all of the group at the same time and they could talk to each other. We had problems with the video in that 1 person could not get it working, 1 person’s video froze and the other member of the group worked just fine. At times, I wished we had a virtual conch so that we know who was meant to be talking. Sometimes we had multiple people talking all at the same time. I kept having to try and elicit the opinions of a member of the group who kept on the fence of issues or agreed with the consensus of the majority of the group. In 2 and a half hours we had the whole proposal written, sent to our lecturer and set due dates for completing the steps of the assignment. I enjoyed my first Skype group call. It is a pity that it is not available at school so that we can work on the assignment during school time. I found it useful to use 2 laptops- 1 for Skype and the other to take notes in OneNote and the group wiki. One of the most unusual aspects of my Teacher Librarian university degree is doing one of the assignments via groupwork. To add to the challenge, the group members are spread across the whole state so we are unable to come together in the same place. To help the group plan and write the assignment, I developed a wetpaint wiki tlasleaderassignment.wetpaint.com. The advantage of using a wiki is that group members can contribute to the writing at their convenience. I also used what I have recently learned about embedding and widgets to put YouTube videos about Life after death by PowerPoint and I used a website called doc stoc to embed examples of PowerPoints related to the assignment. My group members seem to be liking what I have created for the group. One team member called me a champion because I was able to give him explicit instructions on how to access and edit the wiki. The theme for this year’s book week is One World, Many Stories. With such an open theme, I found it very challenging to come up with a display idea for the Library I work in. 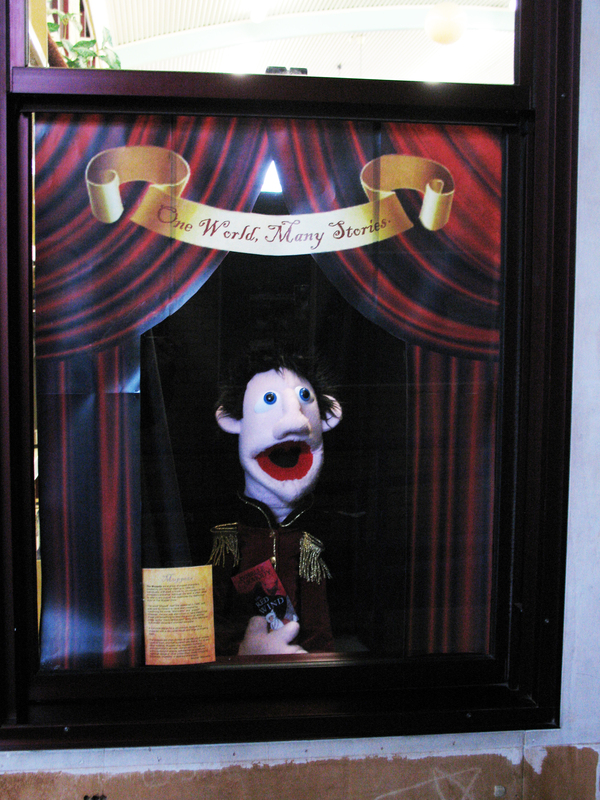 When I recently recieved a new puppet from Vietnam for my collection of puppets- I was inspired! Before books, puppets were used to tell stories. What if I used my collection of puppets from around the world as my display. 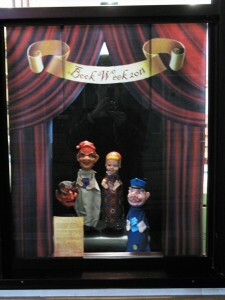 I could also use the windows at the front of the library similar to department store windows and put the puppets in them. 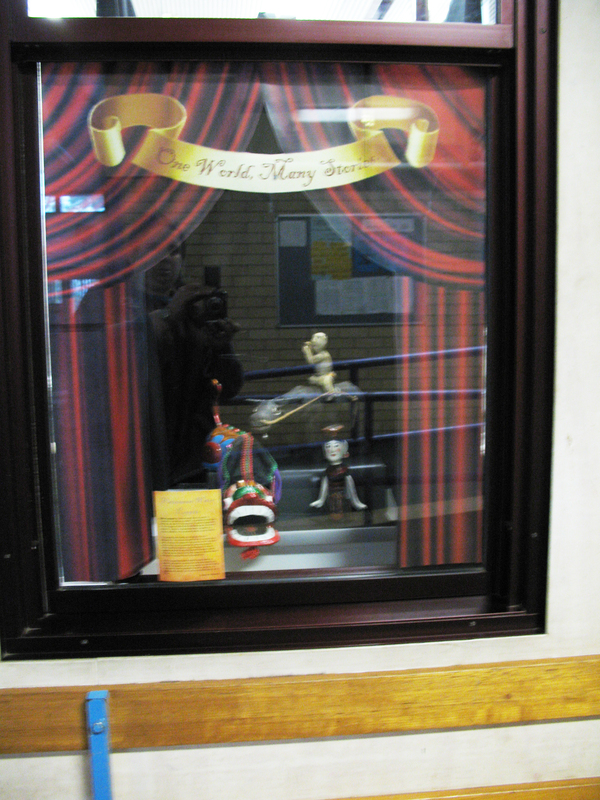 I wanted to try and make each window like a puppet theatre so it needs a curtain and a banner celebrating the theme. I found the curtains image on the internet at http://www.myvbay.com/2011/06/one-enchanted-eveing-musical-review.html, and I found the banner/ ribbon in MS Publisher 2007 clipart. To make the curtains fit the window, I measured the windows and transferred those measurements to MS Publisher 2007. I then resized the curtains to fit, printed it out on multiple sheets of A3 paper, glued the pages together and cut out the opening to see the puppets. I then used sticky tape to ‘hang’ the curtains in the window. The backgrounds behind the puppets are 3 panel folding display boards with black fabric draped over the top. 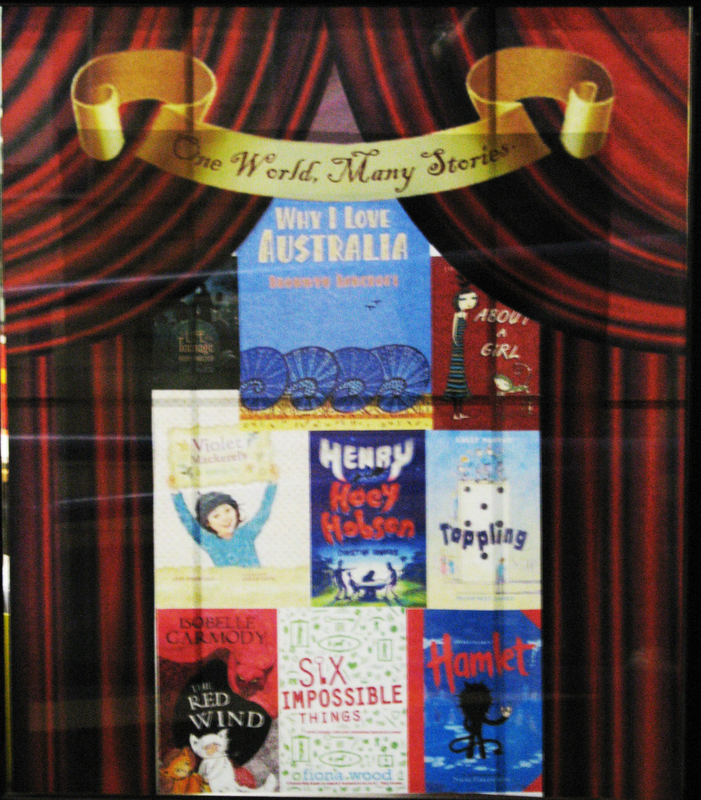 All of the puppets except my Vietnamese Water Puppets are holding scaled copies of book week nominated titles. 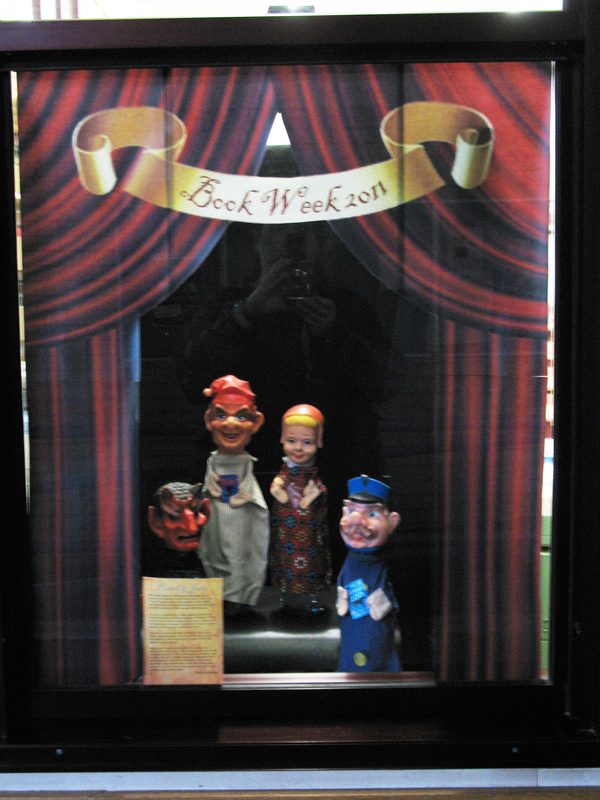 I could not attach copies of the book week books to the puppet’s hands without damaging the paintwork on the puppet. 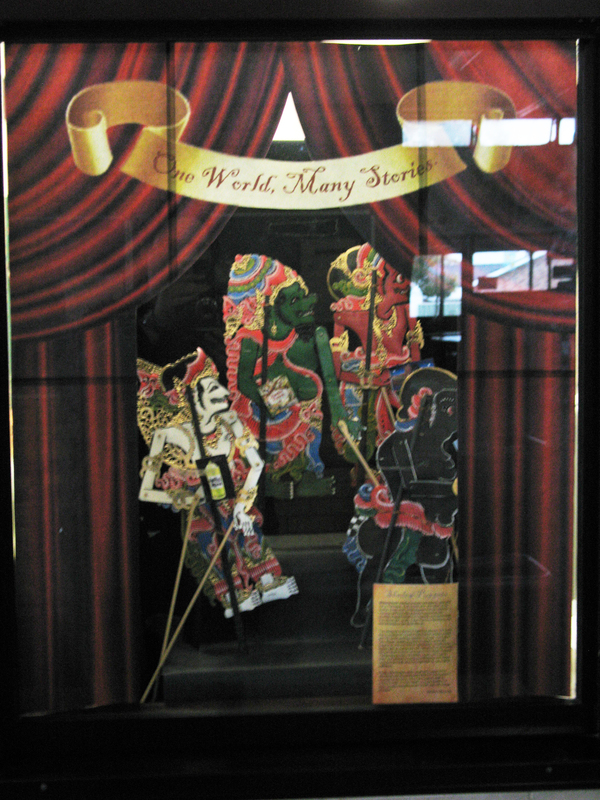 Wayang Kulit Shadow Puppets Holding more bookweek titles. This has been a wonderful opportunity to blend my passion for puppets with my role as the Teacher Librarian as well as creating a talking point around the school. Many teachers have suggested that I design animated windows for Christmas just like some of the major department stores here in Australia… we’ll see when Christmas comes around. 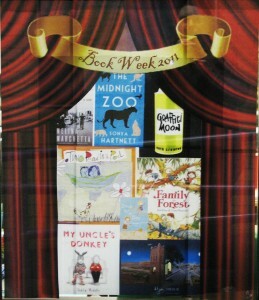 Book week will be held this year from August 20 to 26th. In general, what I have discovered is that most of the scholarly papers on the subject do not take into account the needs of children in their criteria and that their criterion require children to have a background knowledge of the topic they are researching to be able to recognise the reliability of the information. My response to that is- children may be finding out information on a topic for the very first time- how are they supposed to have background information? Students can be provided with basic background information through quality teaching and quality marking criteria but if the student is encountering the topic for the first time- their background information will be limited. Credibility- is the author an expert in the field? What are their credentials? What sort of organisation is hosting the site? Support- Is the same information found on other sites? Are there links to other credible sites of information? Has documentation been supplied to verify the information? Evaluation of CARS for secondary educational use– CARS is very much a tertiary education evaluation tool as it requires users to have an understanding of the meaning of different kinds of credentials in order to make an informed judgement of the accuracy of the website. Harris (2010) did discuss the value of pre- evaluation of the reasons why the user needs to do web searching. Harris (2010) said “Take a minute to ask yourself what exactly are you looking for. Do you want facts, opinions, reasoned arguments, statistics, narratives, eyewitness reports, descriptions?” (paragraph 4) the CARS criteria is tool is not appropriate for most levels of secondary education but the pre evaluation step has value in the secondary classroom as it requires the student to stop and reflect before diving head first into the ocean of the Internet. Johnson’s (2011) criteria for evaluating websites agrees with my original statement that website evaluation criterion need to be a simple strategy. His criteria is based on the acronym SPIDER. Purpose- why was this website created for the world to see? Domain- what type of website is the source? Educational: is this information appropriate for the task and the ability of the students. This particular criteria is of use to teachers planning research tasks so that they have a criteria to evaluate the suitability of the site. Herring (2011) agrees with a need for this kind of criteria. Reliability: is the same information available on other sites? Evaluation of SPIDER for secondary educational use- This acronym is a useful mnemonic to remembering the steps in the process for students. It has incorporated a step for evaluating a website from a pedagogical viewpoint. I think it might be a useful strategy for my assignment. Beck’s Evaluation Criteria from “The Good, The Bad & The Ugly: or, Why It’s a Good Idea to Evaluate Web Sources”. Beck’s (2009) criteria is based on 5 parts of Authority, Accuracy, Objectivity, Currency and Coverage. Like Harris (2010) this criteria is designed for use in a tertiary education context but the guiding questions of this model are succinct and expressed in terms that secondary students could understand with some support from the teacher. This particular criteria would work in a secondary context if the guiding questions were used in conjunction with a model such as SPIDER to develop student’s critical evaluation skills and deepen their knowledge. The criteria developed by Beck (2009) also provides a number of websites in which to practise applying the criteria to. This would be a useful way of training staff and students in using a website evaluation criteria once one is developed for my particular school. My reading of Johnson and Lamb (2007) has brought me to a website evaluation criteria that is designed for the secondary school environment. Designed by the University of California, Berkeley, this set of criteria has a one page checklist that focuses on guiding the students through a simple series of higher order thinking questions. It even comes with a 1 page pdf checklist for students to use. Looking at the URL- what type of site is it? The language used in the Berkeley (2011) criteria guide sheet is suitable for high school students with minor scaffolding required by the teacher and it also explains how to use tools like Google to perform checks using directories and meta-data. I think I am going to use this criteria to evaluate the websites set for the assignment. Herring, J. E. (2011). 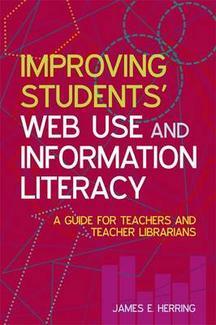 Improving students’ web use and information literacy: a guide for teachers and teacher librarians. London: Facet. Johnson, T. (2011). S.P.I.D.E.R. A Strategy for Evaluating Websites. Library Media Connection, 29(6), 58-59. Retrieved from EBSCOhost. This is the textbook for this semester. I like how practical it is. My first assignment for this semester is a critical evaluation of 2 website evaluation criterion and how effective they are when applied to 4 websites related to a topic in the curriculum. Who: Who wrote the pages and are they an expert? What: What does the author say is the purpose of the site? When: When was the site created? When was it last updated? Where Where does this information come from? Schrock’s criteria is easy to remember for both teachers and students as it is a mnemonic used regularly in both English and History curriculum. I have spent all day talking to my Personal Learning Network about a vision for the future of Libraries. I am concerned with making the Library I manage a relevant place for my students by engaging them in the planning or as Winzenried (2010) describes it- clearly responsive to client needs (pg. 9). I found this concept on youtube while I was looking up information to help me with Citations (see my posting on the useful ideas for later page). I like the concept of Mindspot in that the stakeholders have a say in the vision of the library and planning is directly aimed at their needs and wants.